Civil Engineers work closely in the planning, designing, and construction of buildings and facilities for cities, including roads, water systems, dams, bridges, and airports. Entry Level Civil Engineers may have limited responsibilities or work with a team. Clear resume objectives that identify your confidence, education, and experience are important to set you apart from the competition. Entry Level Civil Engineers must have knowledge of high-level math, construction, engineering, technology, and design. A degree may be required in many cases. When constructing your resume objectives, you should come across as confident and knowledgeable about civil engineering. Highlight your education and any experience you have, internships included. Your prospective employers should be able to decipher your level of education, experience, and ability confidence all within that short objective. In case the hiring manager doesn’t read the rest of the resume, the objective should say everything he or she needs to know in a nutshell. 1. 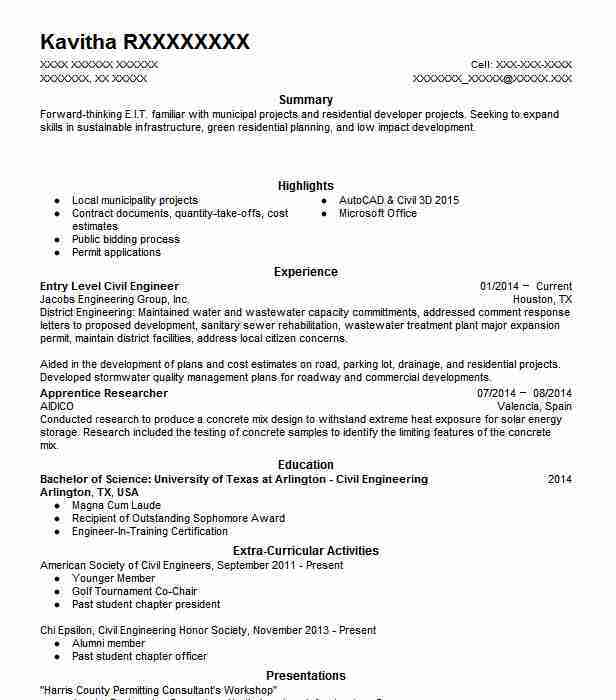 Quick-learning professional with a degree in civil engineering and experience with the process seeking a job as Entry Level Civil Engineer with ABC company. 2. Obtain an Entry Level Civil Engineer position with ABC company to develop knowledge and experience gained while earning a civil engineering degree and working with a firm for 2 years. 3. 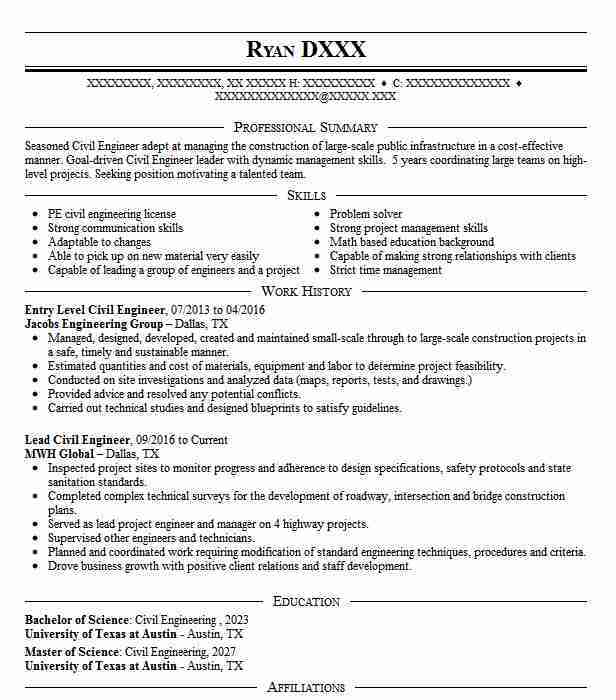 Looking to secure an Entry Level Civil Engineer job for ABC company that allows for further development of physical and problem-solving skills, as well as the utilization of a degree in civil engineering. 4. Passionate, design-savvy individual looking to hone a civil engineering education and internship skills with a position as Entry Level Civil Engineer for ABC company. 5. Seeking an Entry Level Civil Engineer position with ABC company that allows for creative design, problem-solving, and the practical use of a civil engineering degree. Showcasing your professional skills and abilities in your resume is key to your success in the hiring process. Make sure you include a mixture of your top hard and soft skills in your resume objective statement and in your skills and work experience sections. Your skills allow hiring managers to quickly determine whether you’re an ideal candidate for the advertised position. If you’re not sure which skills to include, review the job description for an idea of the top skills the employer is looking for. If these match your own skill set, go ahead and include them. You can also browse entry-level civil engineer profiles on LinkedIn to see the skills other jobseekers choose to list. 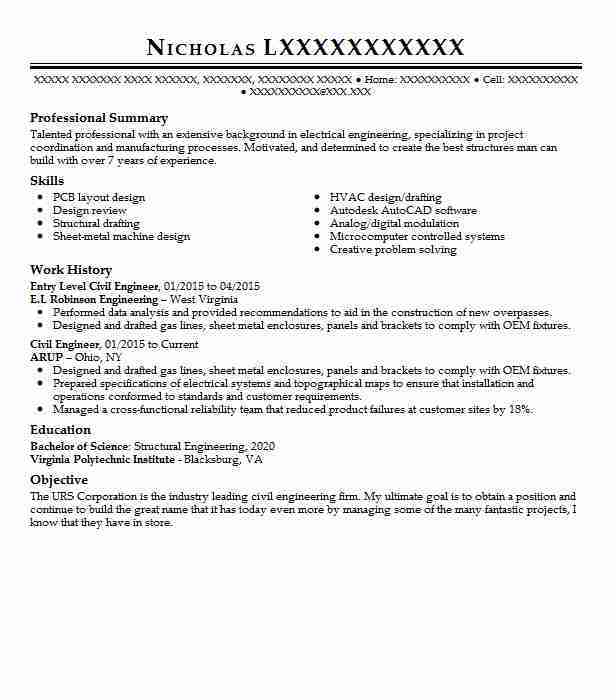 Entry Level Civil Engineer @ Jacobs Engineering Group, Inc.